busts or statues of famous figures to Calvary compositions and amusing statues like the nun above. 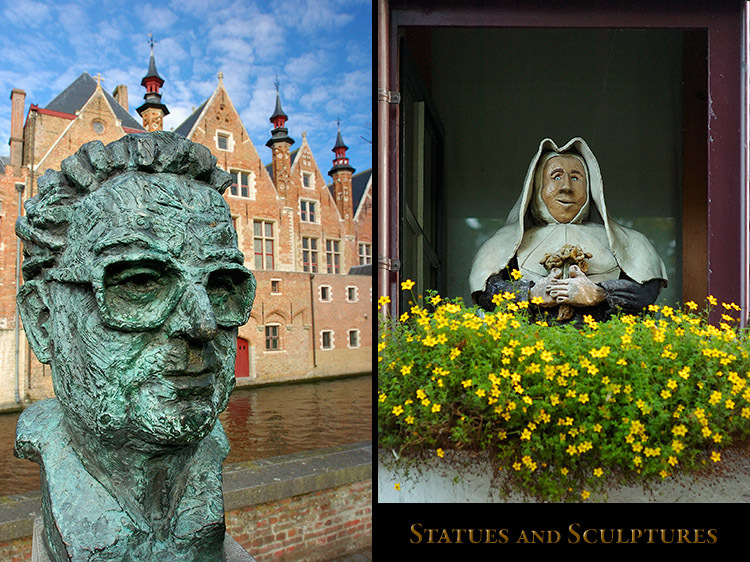 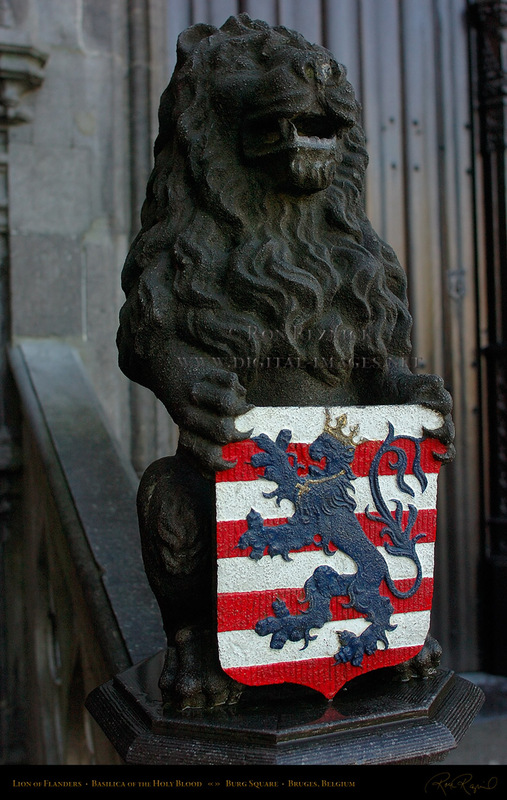 displays 33 images of the Statuary of Bruges (more are displayed on other pages in this section). 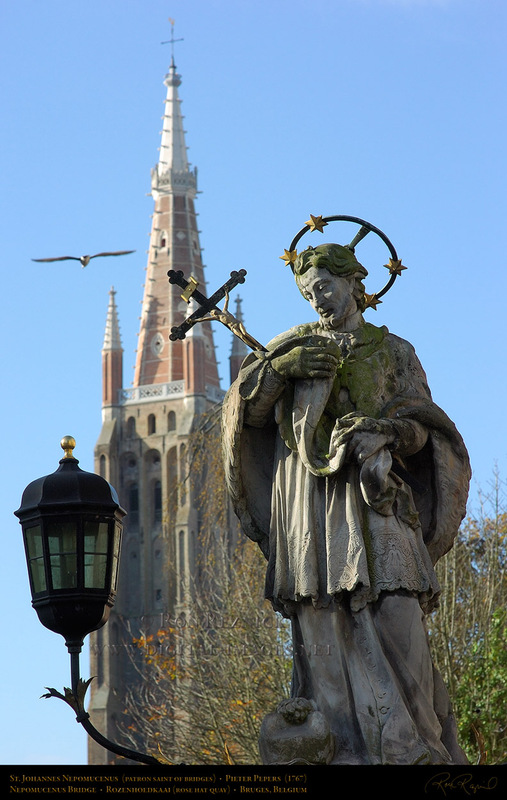 in the background, about to be strafed by a mercenary seagull. 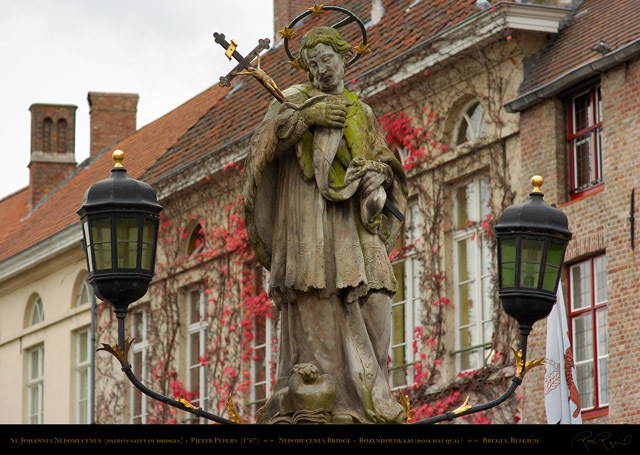 I was training a group of photographers in Bruges, and used this statue to illustrate a technique. 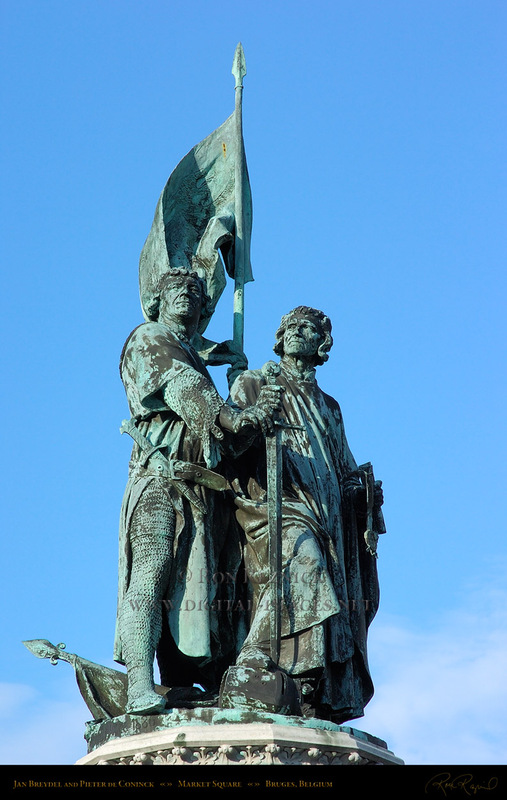 These two images were shot with an 85mm lens using different planes of focus and depth of focused-field to alter the isolation of the statue from the background and presentation of the tower in the scene. 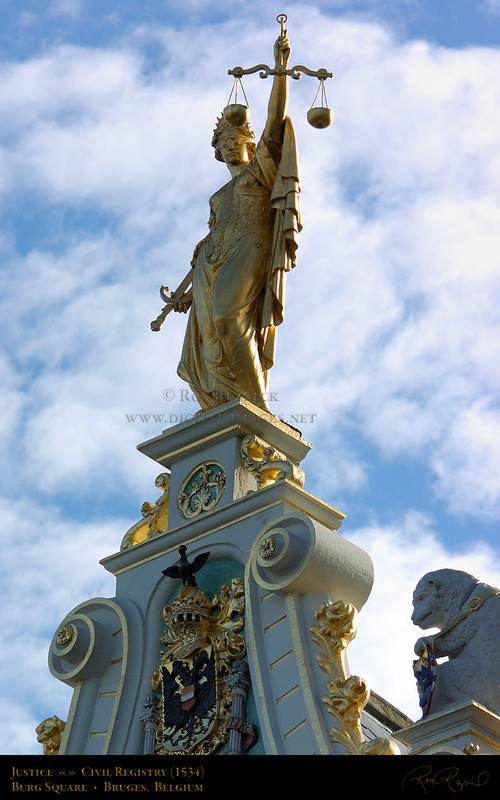 The previous image was shot at f/8 with the focus plane just behind the statue so the tower was only slightly defocused. 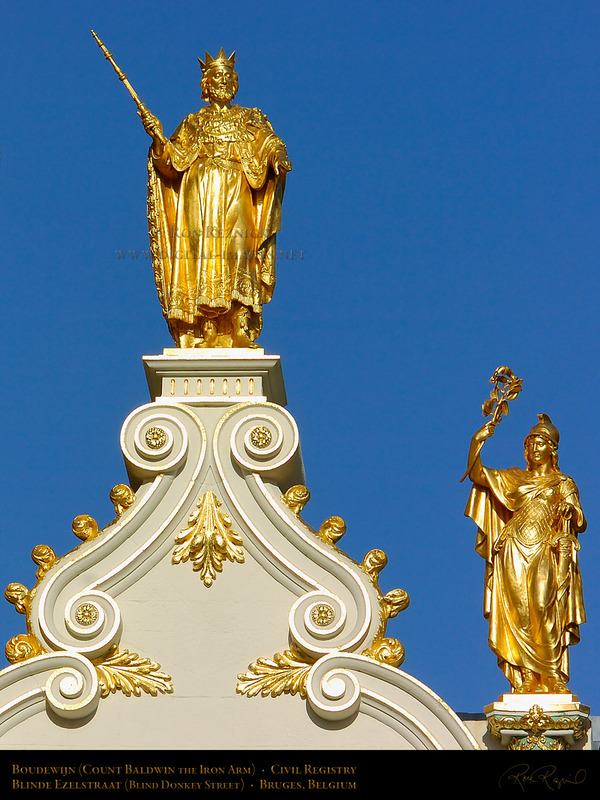 This image, shot at f/5.6 with the plane of focus on the front of the statue, defocused the tower more and made the statue jump out of the scene, while still retaining detail in the tower. Johannes Nepomucenus is the patron saint of bridges and protector against floods. 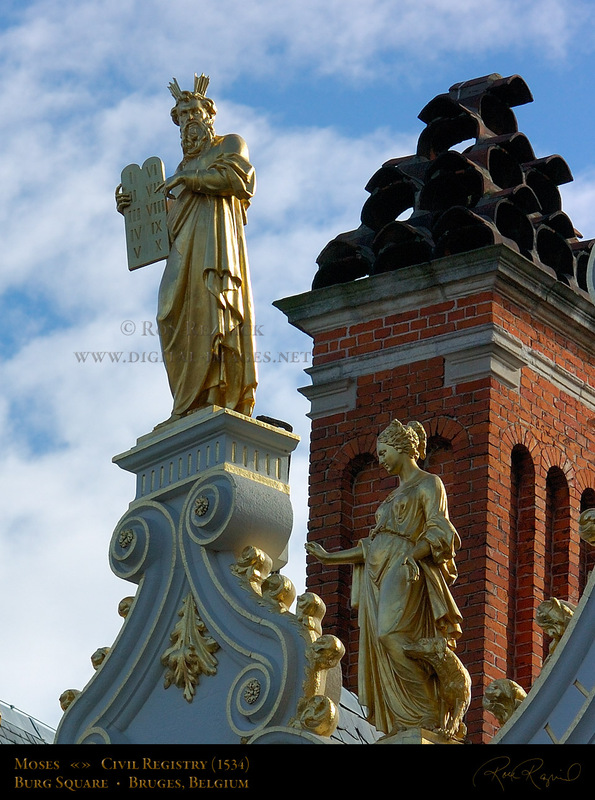 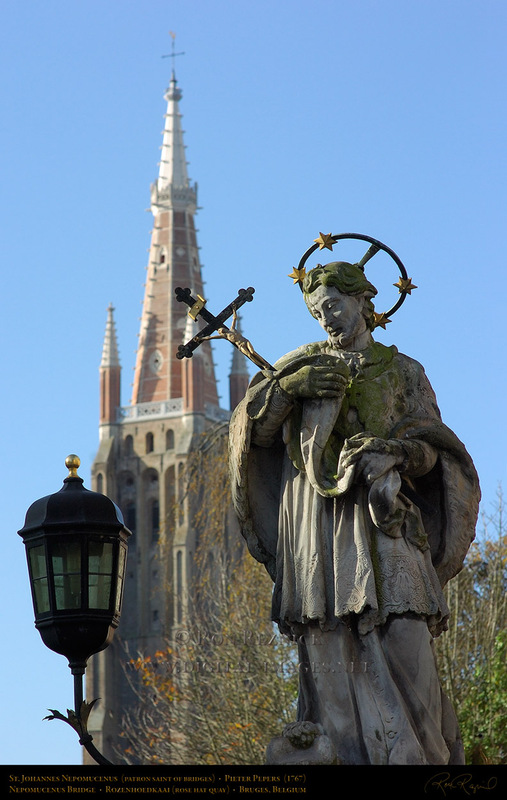 The statue stands on Nepomucenus Bridge, the only bridge across the Dijver, next to the Rozenhoedkaai (Red Hat Quay). The statue of Johannes Nepomucenus, sculpted in 1767, is the best known work of the Flemish sculptor Pieter Pepers. 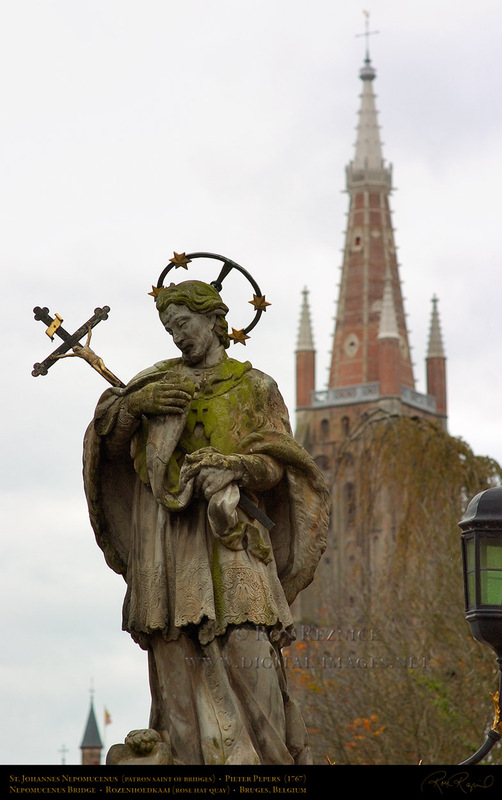 (Nepomucenus Bridge over the Reie River at the Dijver, originally the Eeckhout Bridge, 1282). renamed the Nepomucenus Bridge after the installation of Pieter Pepers’ statue in 1767.
lanterns were added in 1930 and the statue was restored in 1980 by Pierre Goetinck. 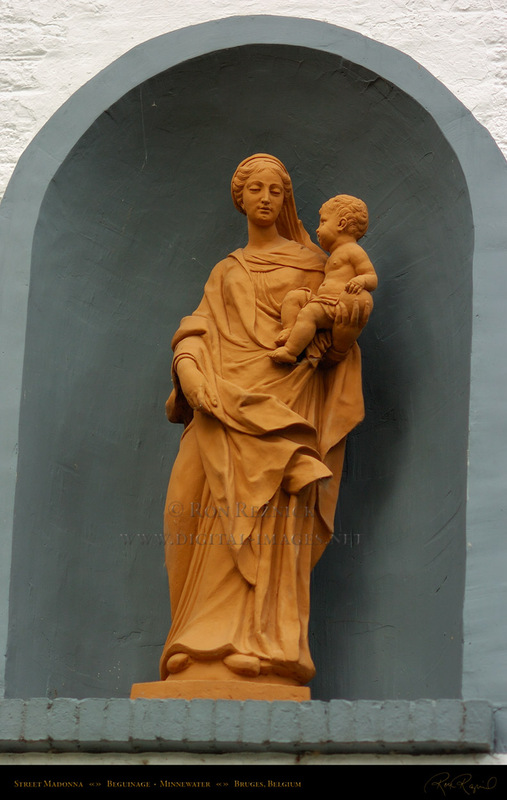 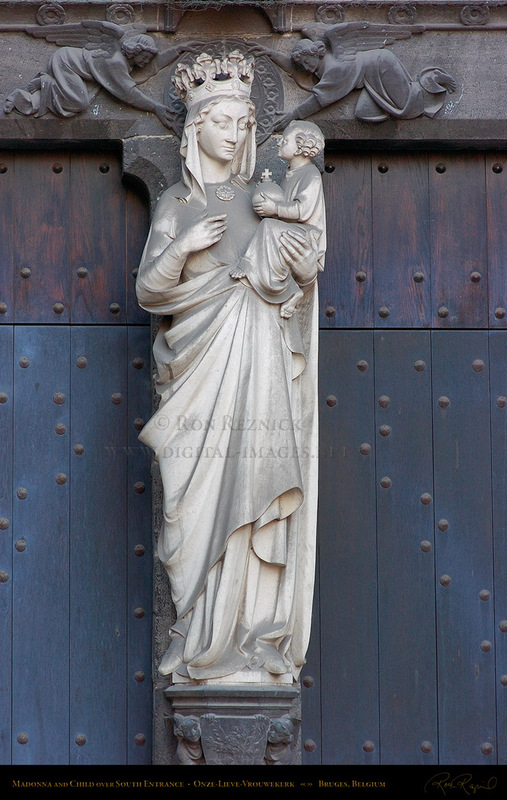 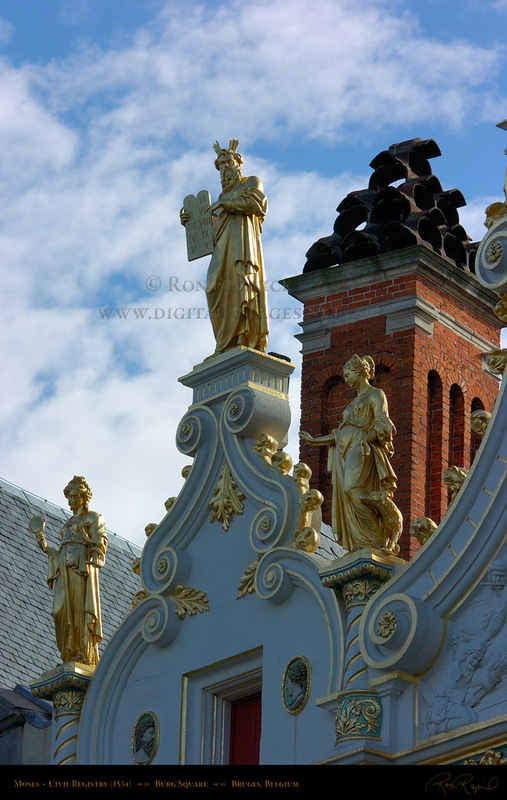 A 17th c. Madonna on the Baroque facade “Maison Curiale” (former rectory of the Beguinage parish, at the Minnewater). 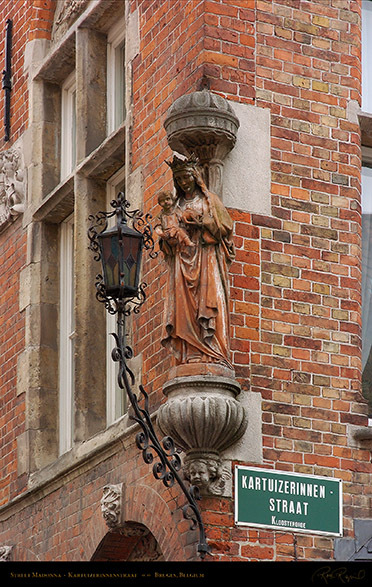 This one (1856) stands on the 17th c. diephuis (deep house) at the corner of the Carthusian Nuns Street and Wollestraat. 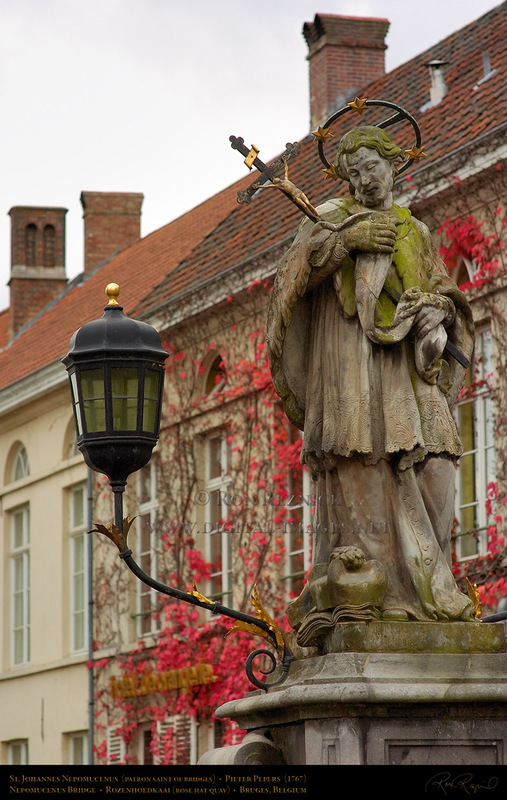 grounds of the Beguinage, just north of the Minnewater. 89 Noordzandstraat has a 1658 Madonna and relief from the facade of the now-defunct brewery “De Gapaert” (c. 1409). 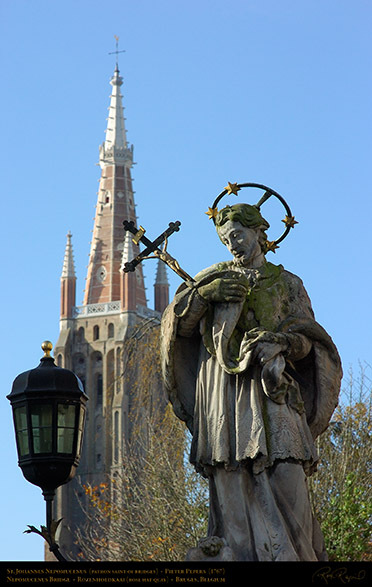 to Onze-Lieve-Vrouwekerk (Church of Our Lady) in Bruges. 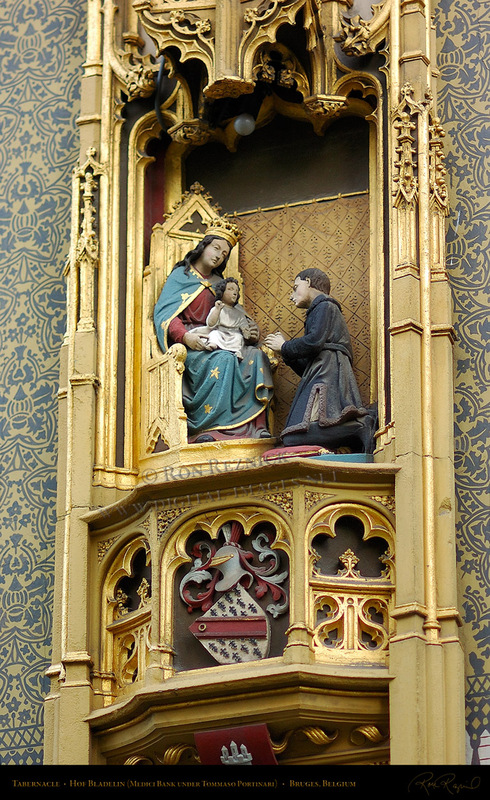 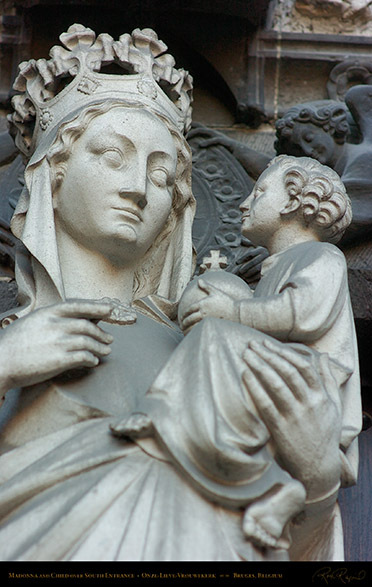 Gothic lunette (detail shown on the OLV-Gruuthuse page). Annaatje van t'Pitje, Carmersstraat at Korte Speelmanstraat, at the location of the well where little orphan Anna was nearly drowned (in the 16th c.). 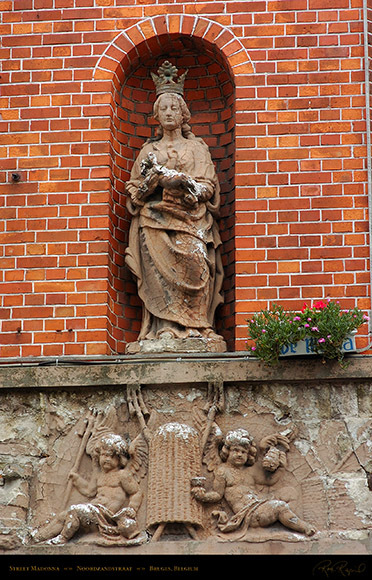 Set upon by thugs and robbed, she was then thrown into the well, which had frozen enough to save her. 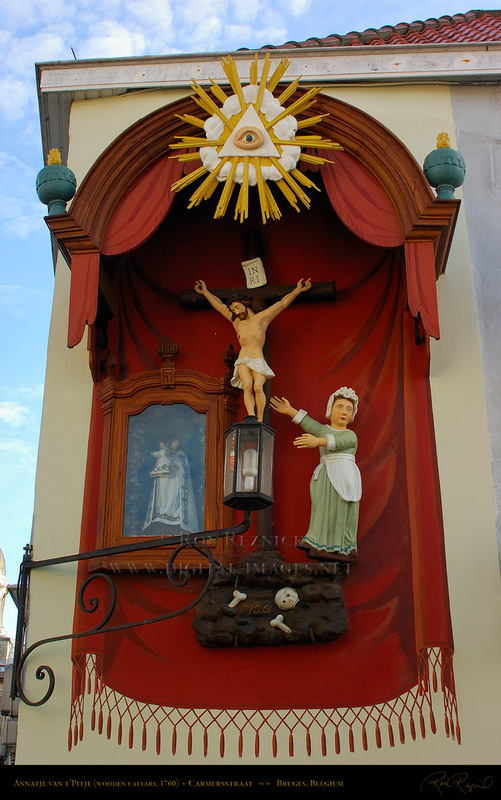 A wooden calvary was created on the site in 1760, with a woman in traditional Bruges dress gesturing towards a crucifix and an enclosed wall chapel under the All-Seeing Eye. 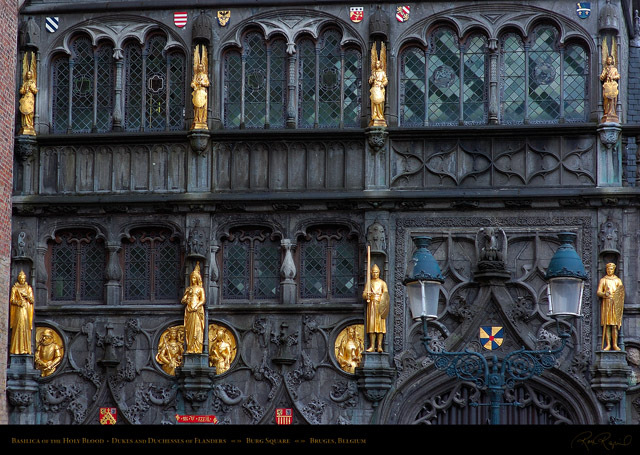 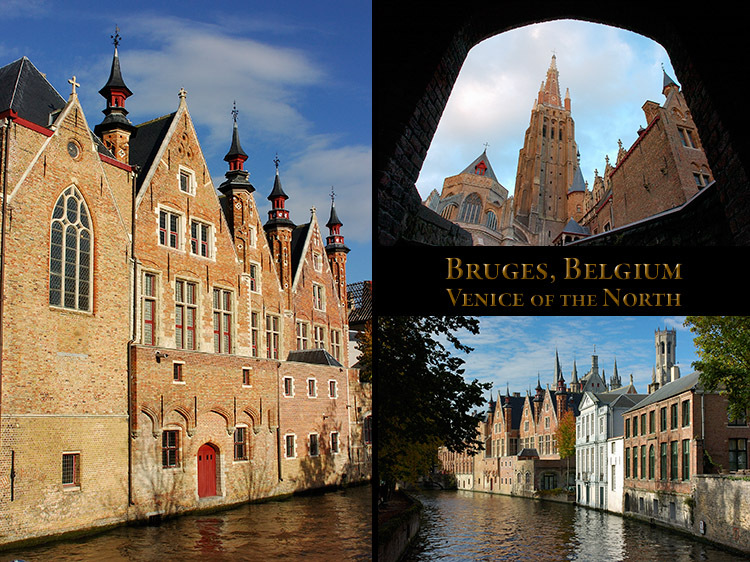 Built c. 1450 by Pieter Bladelin (counselor to Duke Philip the Good), Hof Bladelin was acquired by Piero de’ Medici (1466) and operated as the Medici Bank in Bruges under Tommaso Portinari. The Renaissance tabernacle above is mounted high above the main gate arch on Naaldenstraat at Kuipersstraat. Hof Bladelin is now a convent of the OLV-Hemelvaart sisters. 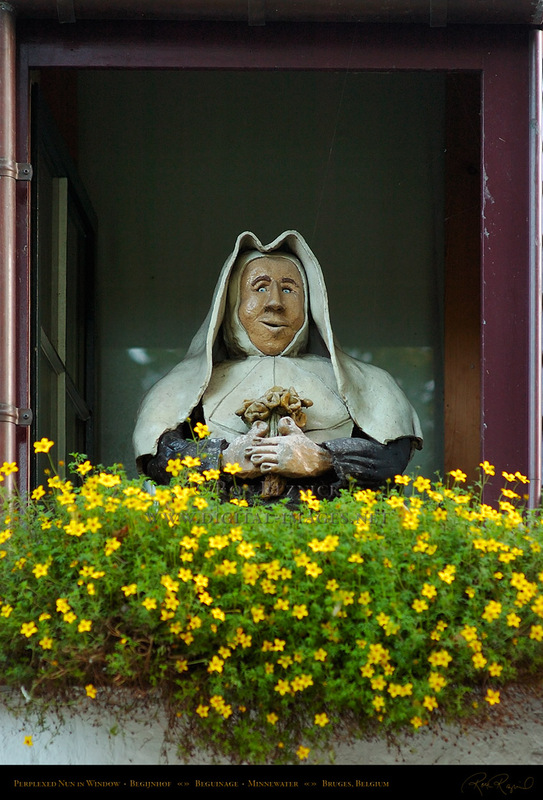 a perplexed nun. Sometimes, on sunny days, they have her wearing sunglasses. of the Basilica of the Holy Blood in Burg Square. by Pieter Pepers (1756) in the Eiermarkt (Egg Market). The statue of Achiel van Acker, 4-time Belgian Prime Minister in front of Joseph Ryelandt Zaal (Concert Hall), formerly the 17th century convent and church of the Theresian Carmelites. 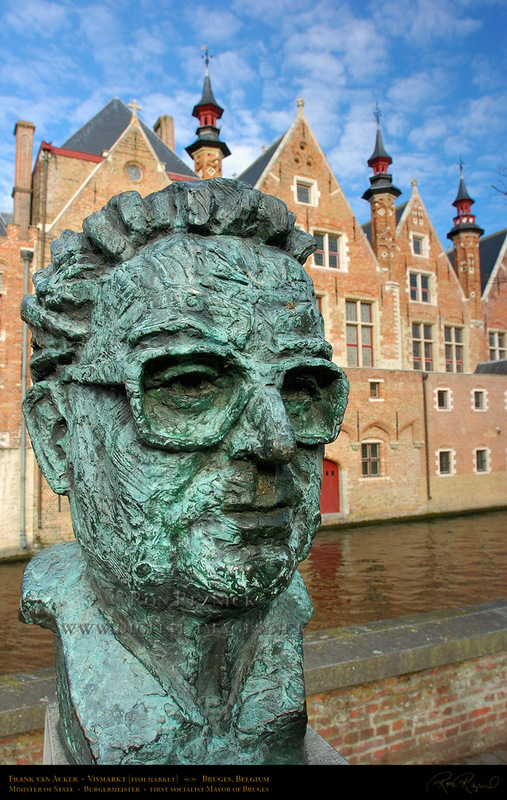 The bust of Frank van Acker (Achiel’s son, the first Socialist Mayor of Bruges), by Fernand Vanderplancke stands at the Vismarkt with Landhuis van het Brugse Vrije across the canal. 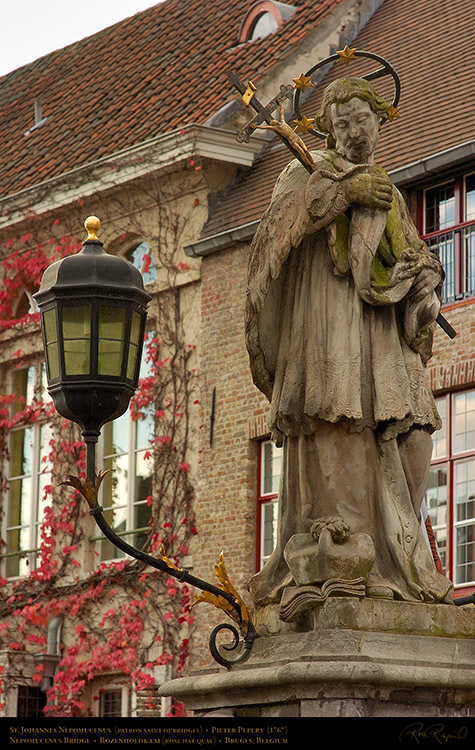 Gezelleplein. 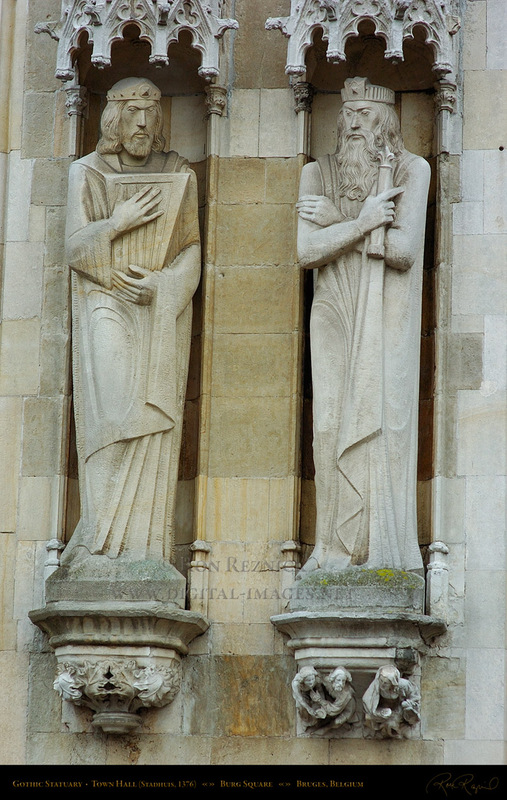 There is a similar statue by this sculptor with our hero sleeping while holding a harp. 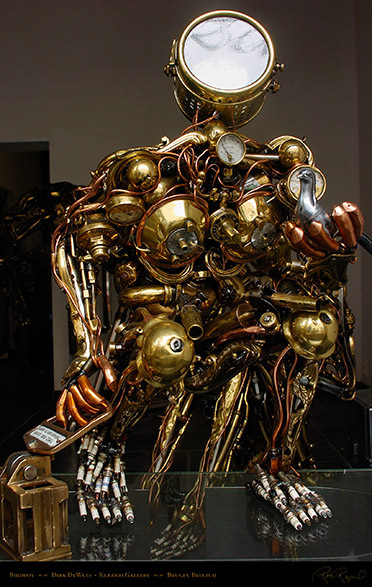 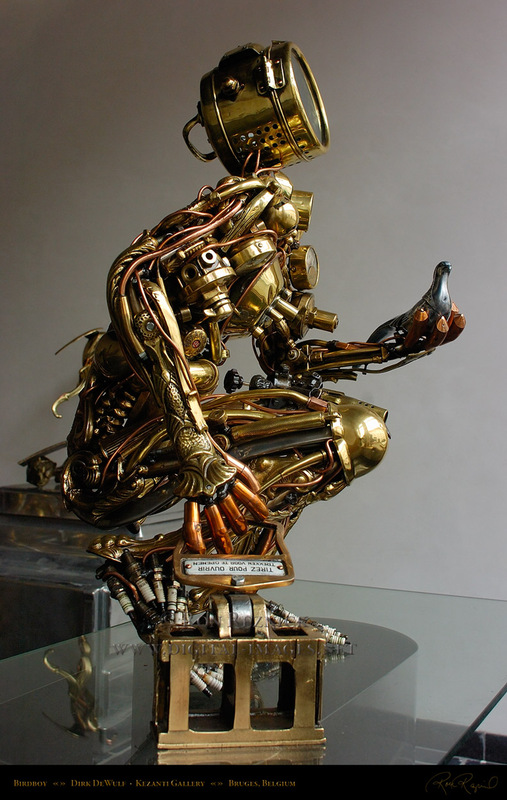 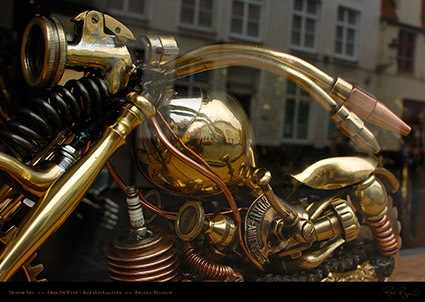 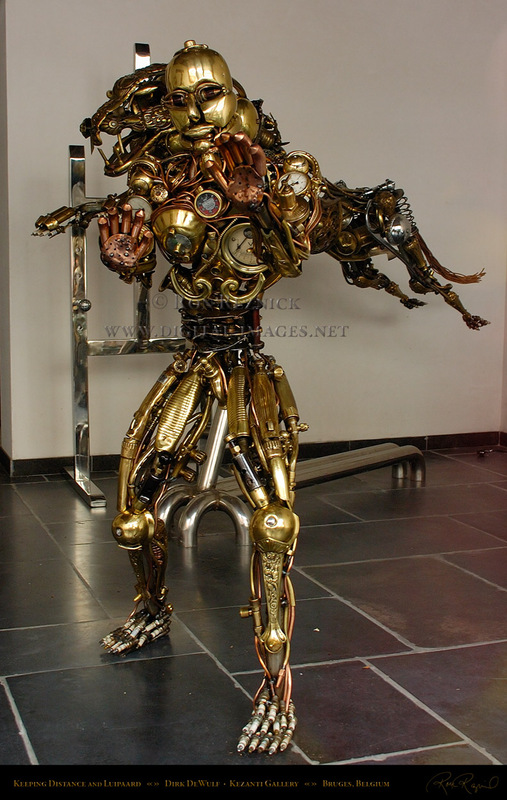 and machines from scrap metal and vintage machine parts since 1987.
anthropomorphic sculptures of Dirk DeWulf, Kezanti Gallery. 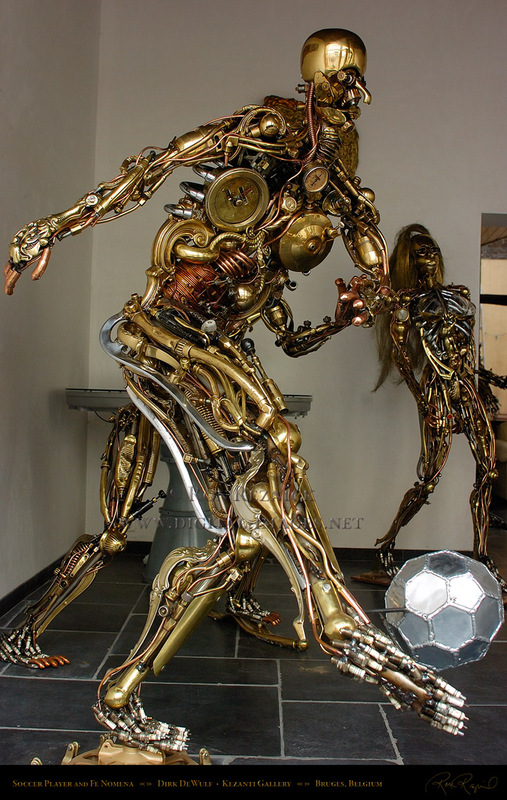 and spark-plug toes to go along with his machine-part body. The Soccer Player and Fe Nomena (background right). as the Panthera Pardus) leaping in the background. 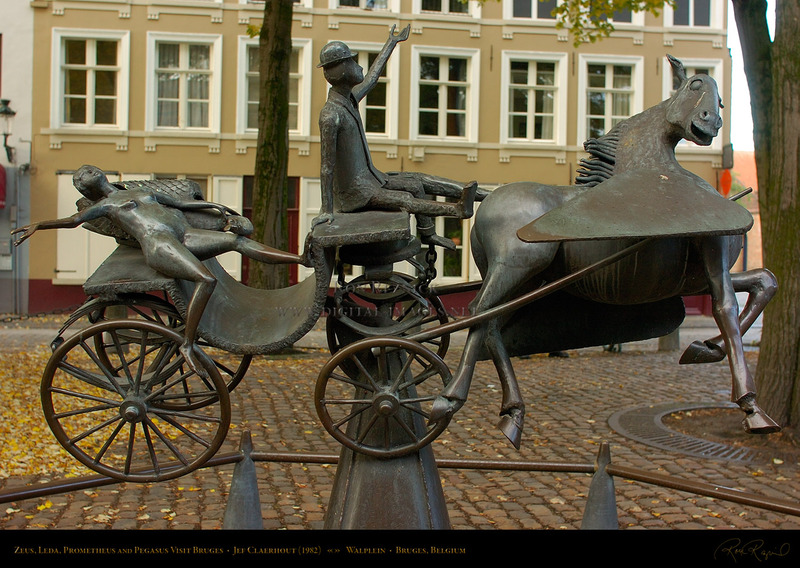 to rethink the use of cavalry in future battles. It was one of the worst defeats in French military history. The image above is a detail crop of the wider scene. destroyed in the aftermath of the French Revolution. 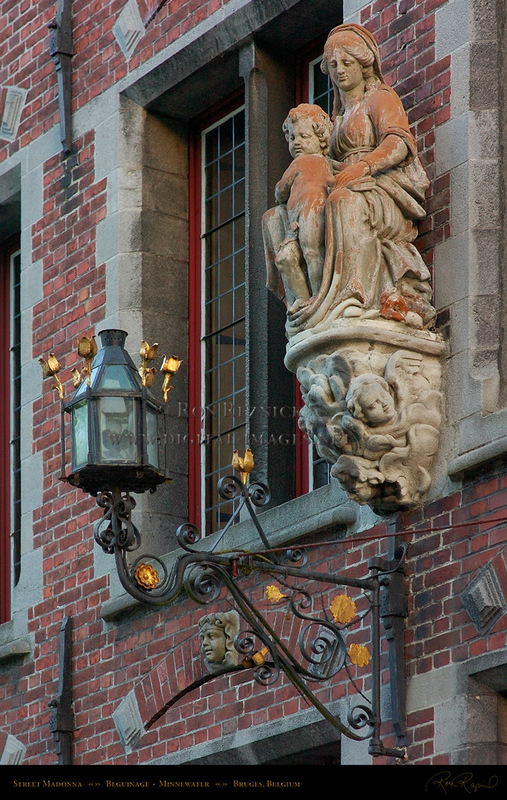 the Civil Registry, over the archway at the end of Blinde-Ezelstraat (Blind Donkey Street). 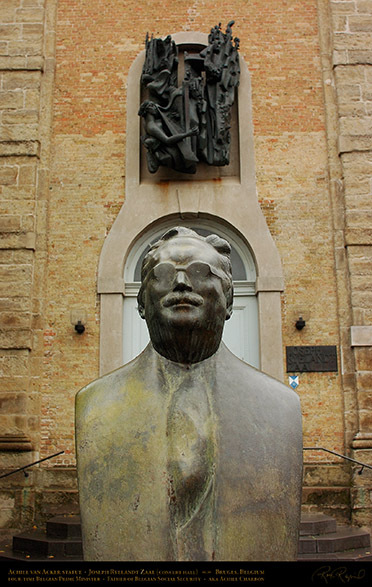 of originals destroyed in the aftermath of the French Revolution. 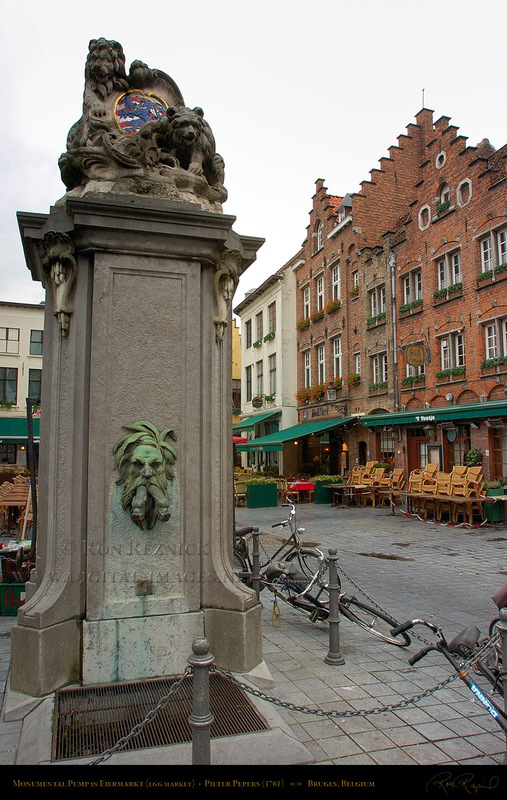 Zeus, Leda, Prometheus and Pegasus Visit Bruges (1982). Zeus is represented as the Swan (a rather unusual looking one at that). 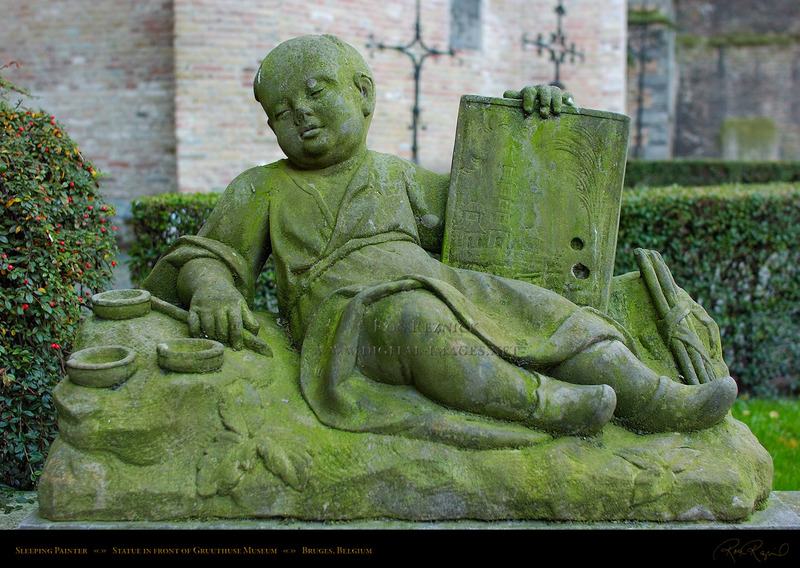 sculpture providing a fitting climax to this portfolio on Bruges.